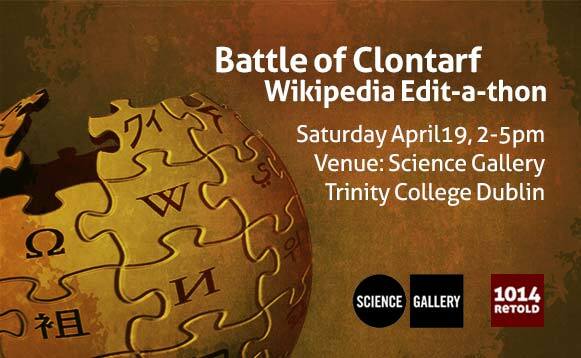 On Saturday 19th April, 1014 RETOLD is bringing historians and Wikipedia editors together to improve the quality of the Wikipedia entries relating to the Battle of Clontarf. As well as improving the main Battle of Clontarf entry, we will also look at other related entries, including those of key women from that period of Irish history. These include Gormlaith ingen Murchada, Sláine Ní Bhriain (who doesn’t yet have a Wiki entry), and Máel Muire ingen Amlaíb. Have you spotted other entries related to the Battle that need improving? Let us know. This is a free event, open to everyone who is interested in the Battle of Clontarf. All are welcome: from expert historians to people who simply want to learn how to edit Wikipedia. We will go through basic wiki training, then work directly on Wikipedia, with experienced Wikipedians on hand. Don’t worry if you’re a historian who wants to provide input but isn’t so keen on editing Wiki directly, we’ll work around that! If you can’t make it to Science Gallery on the day, you can still take part as an online participant if you email us. Please read the event page on Wikipedia for more details and feel free to add your username or to suggest articles for improvement. Think about which Wikipedia entries you would like to work on. Prepare some materials to bring with you on the day: print the entry & write notes on it. All going well, we’ll have these entries improved just in the nick of time for the 1000th anniversary of the battle! Logistical support is kindly provided by Wikimedia UK. Thanks goes to Science Gallery as the host venue. < Boru – the man, not the drink.